^ Siener, T; Cambareri, A; Kuhl, U; Englberger, W; Haurand, M; Kögel, B; Holzgrabe, U (2000). "Synthesis and opioid receptor affinity of a series of 2, 4-diaryl-substituted 3,7-diazabicylononanones". Journal of Medical Chemistry 43 (20): 3746–51. ^ Holzgrabe, U; Cambareri, A; Kuhl, U; Siener, T; Brandt, W; Strassburger, W; Friderichs, E; Englberger, W et al. (2002). "Diazabicyclononanones, a potent class of kappa opioid analgesics". Farmaco (Societa chimica italiana : 1989) 57 (7): 531–4. ^ Holzgrabe, U; Brandt, W (2003). "Mechanism of action of the diazabicyclononanone-type kappa-agonists". Journal of Medical Chemistry 46 (8): 1383–9. ^ Kögel, B; Christoph, T; Friderichs, E; Hennies, HH; Matthiesen, T; Schneider, J; Holzgrabe, U. (1998). 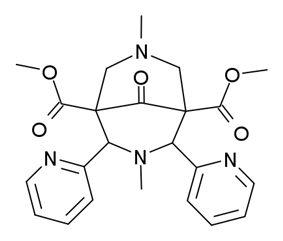 "HZ2, a Selective Kappa-Opioid Agonist". CNS Drug Reviews 4 (1): 54–70.